The Star Lovers is one of our Favorite Fairy Tales. All you that are true lovers, I beseech you pray the gods for fair weather upon the seventh night of the seventh moon. For patience’s sake and for dear love’s sake, pray, and be pitiful that upon that night there may be neither rain, nor hail, nor cloud, nor thunder, nor creeping mist. Hear the sad tale of the Star Lovers and give them your prayers. So she laboured, and the gods had garments to spare. But she herself, poor maiden, was ill-clad;she recked nothing of her attire or of the jewels that her father gave her. She went barefoot, and let her hair hang down unconfined. Ever and anon a long lock fell upon the loom, and back she flung it over her shoulder. She did not play with the children of Heaven, or take her pleasure with celestial youths and maidens. She did not love or weep. She was neither glad nor sorry. She sat weaving, weaving ... and wove her being into the many-coloured web. “It is my duty,” she said. “Wherefore are you displeased with me, my father?” she said, and her fingers plied the shuttle. “And wherefore should I be as others are?” she said. “A foolish saying,” cried her father, “not worthy of credence. What do we know of age-long sorrow? Are we not gods?” With that he took her shuttle from her hand gently, and covered the loom with a cloth. And he caused her to be very richly attired, and they put jewels upon her and garlanded her head with flowers of Paradise. And her father gave her for spouse the Herd Boy of Heaven, who tended his flocks upon the banks of the Bright River. Now the Maiden was changed indeed. Her eyes were stars and her lips were ruddy. She went dancing and singing all the day. Long hours she played with the children of Heaven, and she took her pleasure with the celestial youths and maidens. Lightly she went; her feet were shod with silver. Her lover, the Herd Boy, held her by the hand. She laughed so that the very gods laughed with her, and High Heaven re-echoed with sounds of mirth. She was careless; little did she think of duty or of the garments of the gods. As for her loom, she never went near it from one moon’s end to another. And the Herd Boy, her lover, clasped her in his arms. Her face was all tears and smiles, and she hid it on his breast. So she lived her life. But her father, the Deity of Light, was angry. Three times he warned his daughter. Three times she laughed softly and shook her head. He said, “You shall find it otherwise to your cost.” And he banished the Herd Boy for ever and ever to the farther side of the Bright River. The magpies flew together, from far and near, and they spread their wings for a frail bridge across the river, and the Herd Boy went over by the frail bridge. 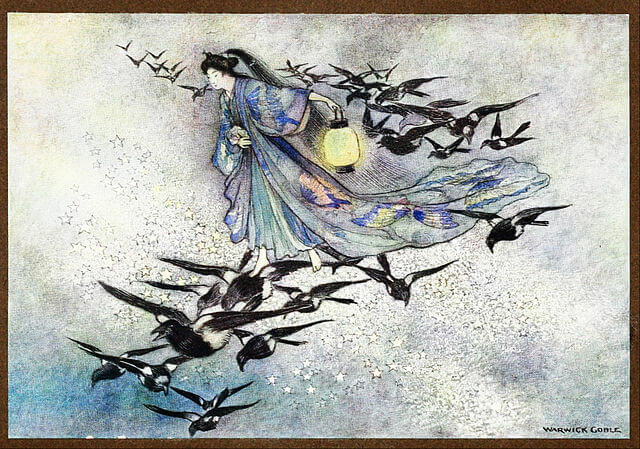 And immediately the magpies flew away to the ends of the earth and the Weaving Maiden could not follow. She was the saddest thing in Heaven. Long, long she stood upon the shore, and held out her arms to the Herd Boy, who tended his oxen desolate and in tears. Long, long she lay and wept upon the sand. Long, long she brooded, looking on the ground. She arose and went to her loom. She cast aside the cloth that covered it. She took her shuttle in her hand. “Age-long sorrow,” she said, “age-long sorrow!” Presently she dropped the shuttle. “Ah,” she moaned, “the pain of it,” and she leaned her head against the loom. Her tears fell like rain, but she took up the shuttle and laboured diligently, weaving the garments of the gods. Sometimes the web was grey with grief, sometimes it was rosy with dreams. The gods were fain to go strangely clad. The Maiden’s father, the Deity of Light, for once was well pleased. “I knew it,” she said. So it was. On the seventh day of the seventh moon came the magpies from far and near. And they spread their wings for a frail bridge. And the Weaving Maiden went over by the frail bridge. Her eyes were like stars, and her heart like a bird in her bosom. And the Herd Boy was there to meet her upon the farther shore. And so it is still, oh, true lovers—upon the seventh day of the seventh moon these two keep their tryst. Only if the rain falls with thunder and cloud and hail, and the Bright River of Heaven is swollen and swift, the magpies cannot make a bridge for the Weaving Maiden. Alack, the dreary time! Therefore, true lovers, pray the gods for fair weather. This story is featured in our collection of Short-Short Stories and Favorite Fairy Tales. Add The Star Lovers to your own personal library.